Chanel always creates the most sensational runway shows. The 2012 Spring/Summer show was no exception with a magical underwater theme. Oddly enough, one of the most standout pieces were seen in the hair of the runway models. During the show, the girls had slicked back hair decorated with beautiful lustrous pearls. Not only was the look definitely mermaid-like, it was elegant and simple enough for everyday life! Love how they seem randomly placed and are of varying sizes. So ethereal! psst... erm... omg, can you say perfect skin? Though single pearls are not commonly seen in hair, Chanel was definitely not the first to wear them in hair. 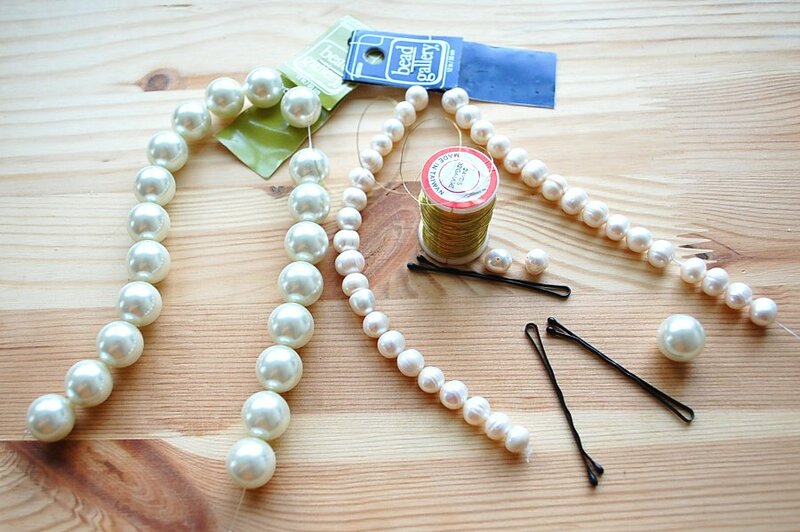 Surprisingly enough, it's really difficult to find bobby pins fashioned with single large pearls. The only ones that I found are these here, but the pearls are cheap plastic, and the pearls are all one size. Luckily, these gorgeous accessories are very easy to DIY! 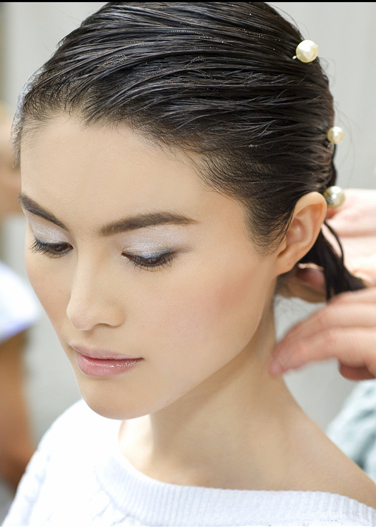 Anything too small will look zit-like, and anything too big will only be suitable in a hair bun or ponytail. The ones in this tutorial are 8 mm freshwater pearls and 14 mm glass faux pearls . Plastic faux pearls will be slightly less lustrous and will dull with time. Plus, I love the weight of the higher quality pearls. The thread used in this tutorial is 32 gauge. Available in silver , and gold . I also tried using white thread instead of wire thread. This rendered less than satisfactory results; the pearls would wiggle and move around on the bobby. 1. Cut 11 inches of wire thread and twist the middle of your thread onto a bobby pin end. 2. Wrap the thread a few times around one side of the bobby for additional support. 4. Loop the metal thread around on the other end a few times, and tie a couple knots. 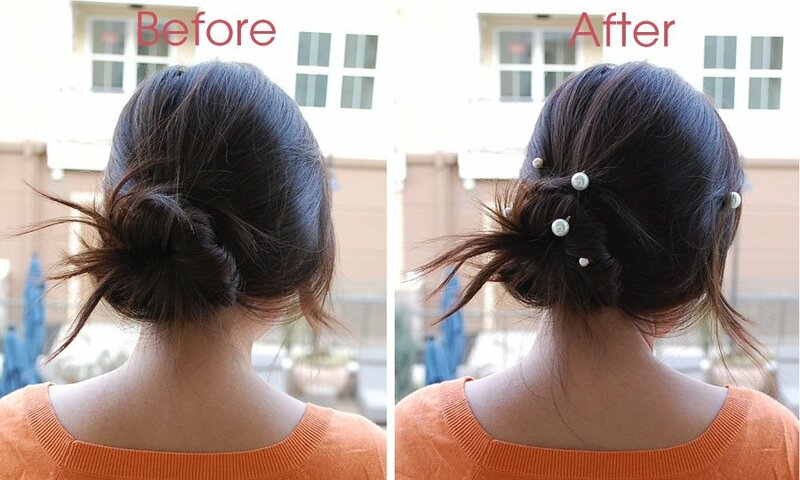 These pretty pearl bobby pins look great with loose flowing hair, buns, ponytails, etc, etc! When I was younger, I used to wear bows in my hair. This look is too childish for me now, but I still miss having pretty little ornaments on the side of my head. This is the perfect age-appropriate substitute! On the left is an actual Chanel bobby pin used during the 2012 Chanel S/S Ready To Wear show. The one on the right is the DIY. Chanel made a pearl hairpin set for retail; these were a huge hit and flew off the shelf. Unlike the runway pearls, these pins have an additional cc logo. They are very hard to find now and usually sell for more than their original retail price of $350. What do you think? Love or hate the pearl look? What did you think of this DIY project? If you enjoyed this, you'll also like our Lollipuff glass bauble necklace DIY tutorial.